2006 was planned to be the year I finished my regular German passenger track, so I started early with some snapping up of unconsidered trifles in Bavaria. Unusually, the cheapest way of getting there proved to be via Heathrow, so I had a fairly tortuous journey! First outing for 2006 with an all UK leg today. H had a meeting in Leeds so for once she was equally to blame for the early start! We left a car for her at Telford Central and boarded a slightly late ATW 158 on the 0613 to New Street. It just scraped into Wolves alongside the 0628 Pendo and miraculously was given priority (what? Sensible train regulation? Lawksamercy!) so was into BNS in good time for H’s Voyager to Leeds at 0703 and my Pendo to Coventry at 0700. Back to Tile Hill on foot at lunchtime (having missed the bus) for the 1339 Desiro to New Street. Just made it to Moor Street for the 1412 to Marylebone. I can’t remember when I last did the GW (&GC) to London, so it was quite an interesting run. Dead on time despite some problems with the kart before Leamington. Reasonably comfortable, and pleasant staff. Who needs VT? Very amiable ticket office Bert at Marylebone who provided a travelcard and a single Wolves-Telford for Sunday. Remaining admin jobs were completed at Charing Cross with a single to Cannon Street for tomorrow morning. Final stop was for a superb, if expensive pint of Tanglefoot at the Ship & Shovell, while awaiting the 5 minutes late 1741 to Tunbridge Wells on which, amazingly, I had a seat all the way to my destination. My son-in-law kindly obliged with a lift to the station for an impeccably punctual 12 car train to Cannon Street. Arriving on time, I was on the Circle Line by 0652, well chuffed with my new Oyster card which had managed to pick up the off peak rate. Circle to Gloucester Road (for future reference it’s probably easier to change at South Ken) then Piccadilly to Heathrow 123, arriving before 0800 for the 0920 flight. LHR was quiet and having checked in and printed my boarding pass yesterday I had only to wait for security. The plan then went a bit pear shaped with 0920 announced at 0850 as ‘delayed 0950’. Aircraft had been changed, major grumbling from some whose seats had changed (mine didn’t as it happened – but so what if it had? Does it really matter?). Eventually left about 1005 for the take-off queue. Things then improved despite the headwind, with a 1255 (booked 1210) arrival after a straight in approach. Very slow immigration, but made the 1322 S-Bahn (3 late) easily. 1342 was the absolute deadline but with a dodgy 4 minute unbooked connection to P11 at München Ost. 20 minutes at M-Ost was useful, with an opportunity to buy a ticket Simbach – Braunau am Inn and return from an amiable English speaker in the travel centre, buy a Bayernticket for tomorrow from the machine, buy a can of Franziskaner from the shop and finally find out the hard way that only one of the subways (the easternmost) gives access to P11. I chose the wrong one, which didn’t matter at all but might well have done had I been on the later S-Bahn. 1417 to Mühldorf and Simbach arrived on time; double deckers headed by a very lively 218 404. 218 437 double heading another Rabbit passed while we were stopped at Dorfen Bahnhof waiting for the single line. 5 or so late at Mühldorf didn’t matter with a 20 minute connection, and the 628 from Burghausen arrived while I was away sampling the station facilities. A pair of 218s with a tank train was waiting at Tußling somewhat to my surprise having assumed this to be a passenger branch. [It would have surprised me less if I’d realised we were still on the Freilassing line. D’oh!] This also marked the first change from ‘dead flat’ since München airport although still not hilly by any stretch. The source of the tank wagon traffic did turn out to be on the Burghausen branch, at a large chemical (?) works at Gendorf, between Kastl and Burgkirchen. Pirach, further down the branch, also had some stabled tank wagons. 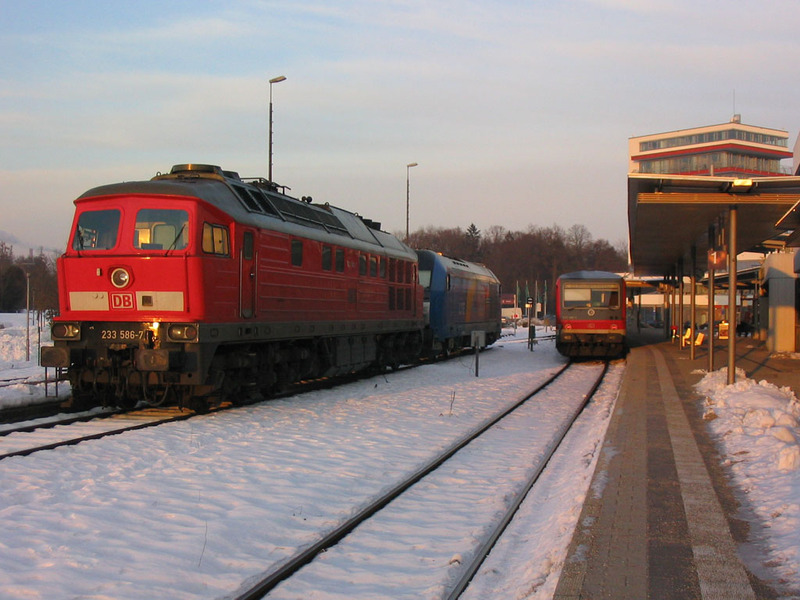 At Burghausen (typical integrated Germany, with immediately adjacent ZOB) a freight branch diverges left just before the station which is, and seemingly was, a terminus. It also contained a 233, a 215 and a smart new Austrian diesel, 2016 903. At Burghausen (there was a bus to Simbach at 1705) I found myself ‘facing’, as the redtops say, a 25 minute wait. Being a civilised spot there was a station buff so I nipped in for a half litre of Spaten pils at a very, nay exceptionally, reasonable €2.20 (no more than £1.80/pint for 5%). It’s a brown bar in all senses, but spotless, as ever, and friendly enough. On returning to the 628, the 233 was on the move, disappearing down the freight branch. Almost immediately (so presumably it’s short!) 217 021 and 225 804 appeared light off the branch. It was just about dark at Mühldorf, not that it mattered, and there was just time to reassure myself that the station facilities were operational (in case they weren’t on the way to Simbach) before joining the 628 for today’s last leg. Too dark to see anything of the line, but all being well daylight will prevail tomorrow. Arrived at Simbach on time, no Austrians present but they turned up after a couple of minutes with a very comfortable single railcar, similar to the single car 628 derivative. It’s a very short potter across the Inn (and the border) to Braunau. Pausing to get my bearings outside the station I realised I was by a bus stop and further investigation revealed there to be a bus at 1834. It duly turned up and charged me a princely €1.00 to the stop right outside the Hotel Post, which given a badly blistered foot from yesterday’s route march at Tile Hill, was just the job. Hotel Post was excellent (with English spoken too) with judgment currently reserved on breakfast! The Bogner hausbrauerei is literally across the road so I wandered over there for supper. There seems to be only one house beer, a conventional but very pleasant weissbier at €3/0.5l. Food as far as I was a concerned was a grillteller which as Austrian regulars will know consisted of a pile of chips, some veg and a steak each of turkey, pork and beef. Fantastic. The whole thing with two beers came to €15.80. Pub was fairly standard with lots of copper bits – brewery location is unknown. [At the back of the pub, I think.] Waitress was very efficient and spoke a bit of English. Full marks to Paul Harrop and [the late lamented] www.newbreweries.fsnet.co.uk for this one (as so often). My favourite diesels were much in evidence at München Ost. This one is 218403, heading west light engine. I was hauled to Mühldorf by a very lively 218 404, seen here on arrival with its double deck stock. 233 586 stabled at Burghausen together with Austrian 2016 903. A good night’s kip and reasonable breakfast, with Frau Lettner very concerned that I was properly fed! I was a bit disappointed by the €1.45 credit card surcharge so paid cash. On the ‘sightseeing tour’ I called in at a bank to change some UK cash but poor rate plus €3.50 commission makes the machine look a better bet. The bus (no. 3) duly departed at 0859, getting me to the station in good time for the 0911 to Simbach, a single unit again (class 5047). Alas it seems that the Germans use P1 at Simbach and the Austrians P2 but at least they overlap so honour is more or less satisfied, there being no advertised through trains. Daylight is prevailing this time, with a lovely winter morning. Seriously cold, though. The 628 treated me to a punctual but fairly dull trundle to Mühldorf; the onward connection to Rosenheim, another 628, was 5 minutes late. This wasn’t too hot with a 10 minute connection ‘right across’ at Rosenheim, but in the event most of the deficit was retrieved (luckily it’s the southbound train which gets the 3 minute pathing stop at Wasserburg). 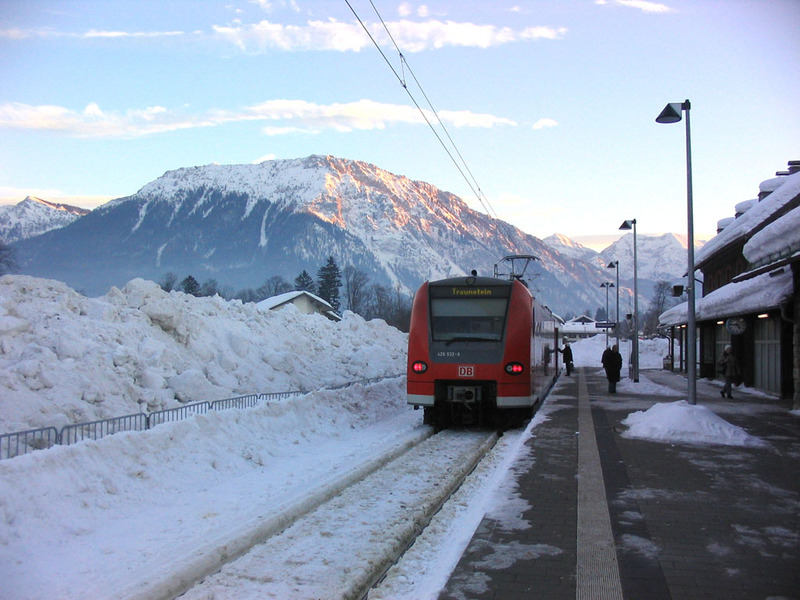 The RB to Kufstein was an Austrian 3-car push pull set working through to Innsbruck and Ötztal – once again more comfortable than the DB equivalent. No problem in the end, with an on time arrival at Rosenheim. The München-Salzburg RB was 5 late, however the connection at Prien is 13, so no problem (?). In fact arrived at Prien 4 late despite some truly horrendous track near Sims, just east of Rosenheim. Then after a rather fraught morning caused by the horrific revenge of last night’s meal and the out of course delays, up pops one of those things which guarantee a Big Daft Grin. I was just walking up to the Aschau bay platform (1a) when the station announcer advised a platform change to P3 on the other side of the main line. So not only do I get the connection in daylight but it saves me traipsing back out from Rosenheim to do it on the last train of the day later on! BDG well in place. 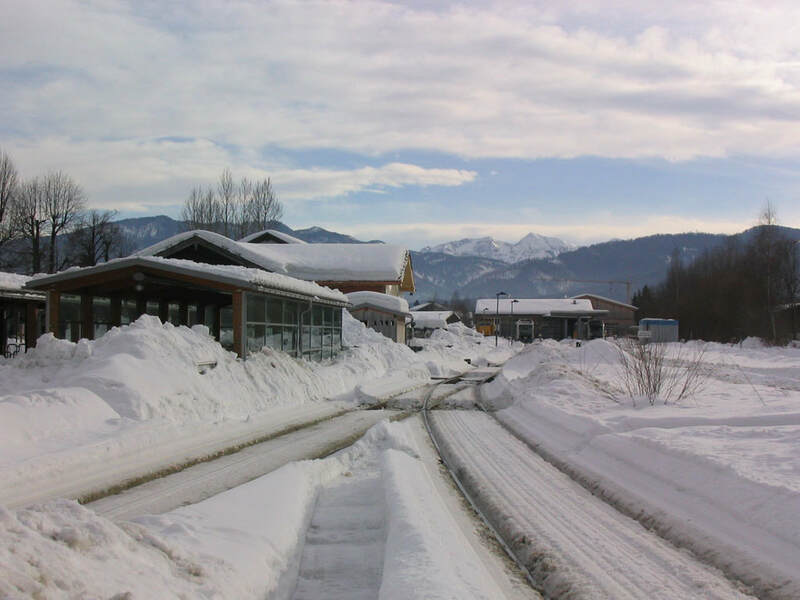 Lots of sun and snow for the celebratory phot at Aschau – a celebratory beer seemed in order but as ever there wasn’t time for the pub and nearby shops didn’t have any. However the morning’s bottle of Sprite was not long finished so at least I didn’t go thirsty. Just to give the lily a bit of gilding we went into P1a on the return – and in case I’d missed anything the München – Salzburg RB was looped into P3 to let one of the Austrian Ecs through on the main line. This is less than helpful in fact, with a fairly short connection at Traunstein… On closer examination you have to join the main line to get to and from the Aschau branch anyway – but at least the Big Daft Grin got an airing. The RB ended up 8 late at Traunstein (nice busy little station) for the 11 minute connection but a) that was enough b) they might have held it, probably would in fact and c) P5 was occupied by a freight so the kart was much nearer, in P1A. 4 late away as a result of waiting for a (very short – Berchtesgaden?) IC to pass. The main line’s bi-di and we ran ‘wrong line’ to the junction, so surely we could have nipped across first? But no doubt it’ll hold together if nothing fails. Waging turned out surprisingly picturesque considering it’s north (flat side) of the Salzburg line. It’s quite hilly and of course the snow helped. 4 late at Waging with a 5 minute turnround so I deemed it expedient just to dash to the Traunstein end (the best bit) for a phot while the driver walked through. Rightly I think, there really wasn’t time for both ends as we were away in 3 minutes with me comfortably ensconced. I didn’t. It’ll be on the phot though, hopefully a nice one with the last of the sunset on the mountain behind the train. [Judge for yourself!] We’ve just started back down the hill and the light is already fading, so it’s all come together in the end. Off to Traunstein and Rosenheim now, but any delays can be lived with (if less than a couple of hours of course). OK so far, with 1745 to Rosenheim on time, and a bottle of Wochinger Bräu Export-Hell to while away the journey. A good chance purchase as it turned out – apart from being quite drinkable it’s also a local Traunstein brew. Back at Rosenheim after only a slight delay on the approach, I set off for the hotel, which shall remain nameless but which was found easily enough. Very slippery underfoot though. Room is minimalist to say the least, but blessedly warm. It’s ridiculously cold outside. [Forecast temperature was down to –20°C and I’ve no reason to dispute that!] Flötzinger Bräu, the more obscure of Rosenheim’s two breweries, was easily located in the pedestrian area in a rather posh pub (Stockhammer, in Max-Josefs-Platz). The draught pils, possibly the palest yellowest beer I’ve ever seen, proved to be very palatable and washed down a Wiener schnitzel nicely. €2.60 the half litre, though the food was quite expensive. Back to the hotel for a final beer, which was Auerbräu I think, though the waitress spoke no English. Pretty unexceptional, whatever. 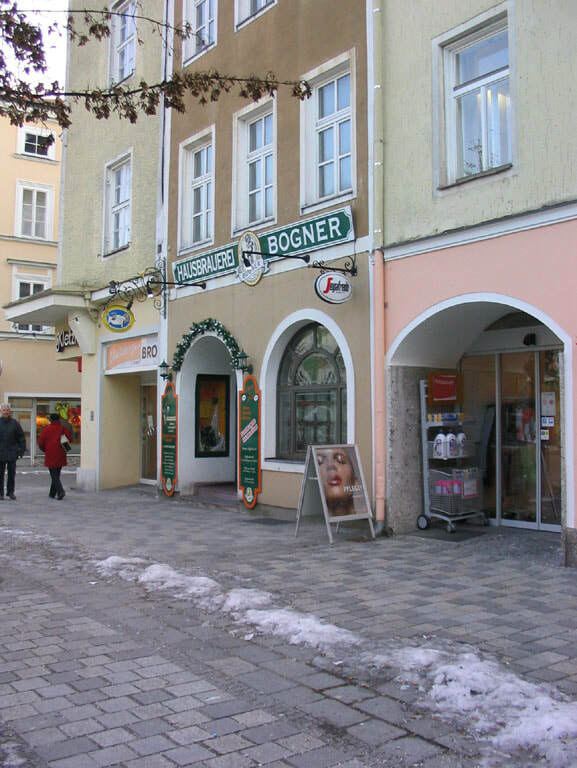 I carried on to Braunau am Inn in the dark on the Thursday and spent a pleasant evening in the Hausbrauerei Bogner. This is the front of the pub, pictured the following morning (Friday 27.1.06) before departure. Back across the border at Simbach (Inn), Austrian railcar 5047 081 awaits the arrival of the DB 628s from Mühldorf. Late in the afternoon suburban unit 426 532 looks a bit out of place in the snowy surroundings of Ruhpolding. Slightly disturbed night due to revellers coming in at 0200 and 0525 but as I’d retired at 2100 and got up at 0700 it didn’t matter. Breakfast spread out along the bar, tables not laid, coffee really horrible, credit cards not taken (went to the cash machine last night luckily). I doubt I’ll be rushing back there. Still, €45 was OK.
Down to the station for 0840 to Kreuzstrasse, but after careful questioning of the machine regarding platforming thereat, I decided to stick to plan A and get 0910 to Holzkirchen, this offering at least a remote possibility of the physical connection with the S-Bahn line to M-Ost. Once again last night’s supper was exacting a terrible revenge (or was it this morning’s breakfast?) but the basement facilities at Rosenheim were so immaculate it was hard to begrudge 50 cents! Pretty unexceptional most of the way to Kreuzstrasse apart from the last stretch from Westerham [not a name I ever expected to see on a station nameboard] where the line goes through quite a steep and narrow valley. At Kreuzstraße (which surprised me by being apparently quite rural) we ran into P3 instead of the booked P2. It made no difference because the S-Bahn has its own dedicated platform slightly staggered from the other two. A similar situation (though all parallel) prevails at Holzkirchen where all Kreuzstraße trains, and nothing else, seem to be off P5. The BOB units aren’t the SULFAs I expected, but four section ALFAs. The three (Lenggries, Tegernsee and Bayerischzell portions) run joined together between München and Holzkirchen and make quite a cavalcade. ‘Deadly dull’ would be a kind description of the S6 from Kreuzstraße to München Hbf. Still, yergottadoitaintcha. I won’t be rushing back for that either. Time at Hbf to check ticket validity and grab a Paulaner in anticipation of a fairly long dry spell with BOB. 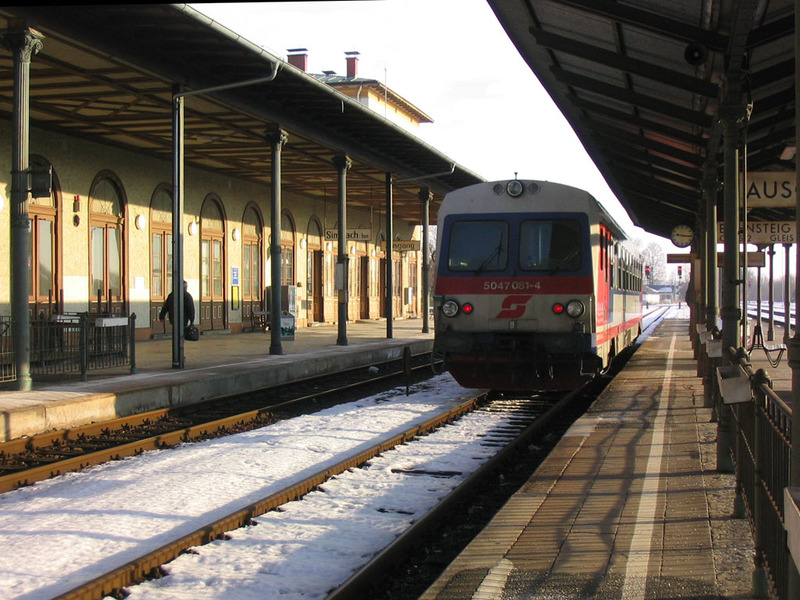 Out to Bayerischzell first – luckily the gripper came round just before Deisenhofen so he was gone in time for me to see my 100 metres of track between the platforms at Deisenhofen and the junction with the line from München Ost! Further on there was track to be had, of course, having only gone as far as Sauerbach on the previous visit to make sure of the connection of the M-Ost line. It’s fairly dire to Holzkirchen and for a while beyond until you get into the foothills of the Alps (not sure if 1800m is really a foothill). Very pleasant for the last bit though, with so much snow at Bayerischzell that I couldn’t get a clear shot in the 4 minutes available. Back to Holzkirchen where the DB shop stocked the local brew – Holzkirchner Oberbräu. Well, you have to, don’t you. Next destination was Lenggries, in the centre set from the cavalcade arriving at Holzkirchen. 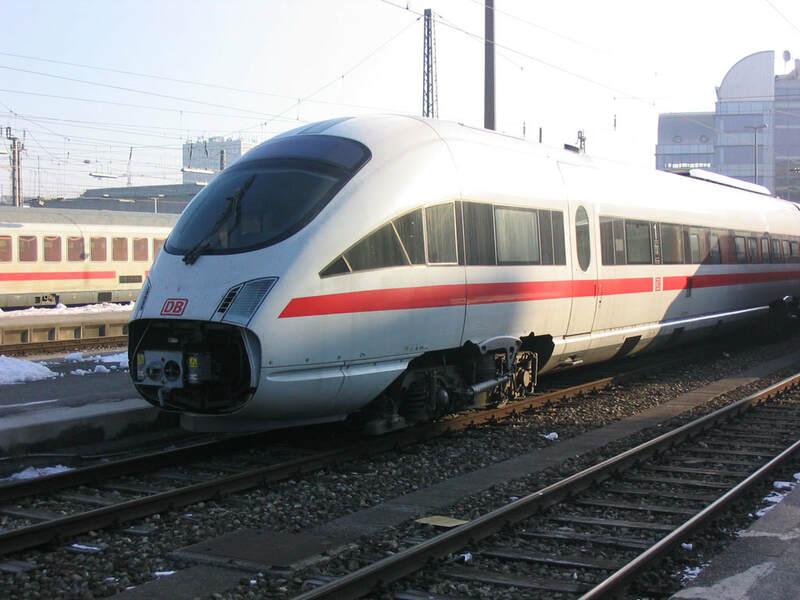 The same gripper has now inspected my ticket three times – München – Holzkirchen, Schliersee – Holzkirchen and Holzkirchen – Schaftlach. He must be wondering… Lenggries is in the upper Isar valley which is quite wide, though at the time of writing the mountains are beginning to gather approaching Obergries, the penultimate station. Snow was being cleared at Schaftlach using a small bendy-chassis Hanomag digger. So that’s how they keep it all so clear! At Lenggries the kart disappeared off to the depot, so the station buffet was a no-brainer. Well, I suppose I could have gone to the pub across the road. Holzkirchner Oberbräu was the order of the day again, in a measure which would have been deemed short even in the Czech Republic. This time vom Fass for extra scratching validity. Music by the Beatles inter alia – Penny Lane, no less. Most amused by a local who came into the buff – four tables empty but he came and sat at the end of ‘my’ table [which wasn’t labelled Stammtisch], about a foot away. What makes me think I was in ‘his’ seat? Watty Colley, where are you now? [Watty, sadly no longer with us, was the longest serving regular at my local and had his own chair and other privileges such as table service]. 40 minutes at Schaftlach didn’t seem like a good idea so I extended the plan a bit and came back to Holzkirchen where there was only a few minutes wait to go down to Tegernsee. Considering how cold it now is (1600) this may well have been a Wise Decision. And Tegernsee, chosen as the last branch only because it offered a couple of minutes extra daylight, proved to be the best. The last portion, from Gmund onwards, skirts Tegernsee all the way round and with the sun just disappearing behind the mountains, was quite impressive. Unfortunately trees and buildings obscure the lake at Tegernsee station and I couldn’t walk far enough in the time available to get a decent shot. Back in München after a restful Z back from Holzkirchen I made a brief food stop at M-Hbf, then off to Theresienwiese U-Bahn for the Hotel Fidelio. Leaving by the Schwanthaler Strasse exit left me only about 100m away which made finding it pretty straightforward. It seems a reasonable enough establishment for €49 in München. Off then in search of brewpubs. First port of call was Union-Bräu in Einsteinstraße. U4 to Max-Weber-Platz, leave by the Einsteinstraße exit and it’s at the top of the steps. The house beers are Hell and Dunkel. I had the Hell and it was. Spectacularly indifferent. All the menus etc. are adorned with the Löwenbräu logo so presumably it’s another badged ‘home brew’. Maybe produced by badgers. Rubbish, anyway. Thence bu U4/Odeonsplatz/U6 to Goetheplatz for the Paulaner Bräuhaus which at least wears its heart on its sleeve. The Thomas Zwickl (4.7%) was a bit on the bland side too, if we’re honest. Compared to the Union-Bräu it was definitely a step up, though. Usual sort of beerhall style, as is Union-Bräu, and none the worse for that. I really can’t be doing with all this lederhosen though. Heavens, if we did it we’d have all the bar staff in smocks… To get to the P-Bräuhaus leave Goetheplatz U-Bahn by the Kapuzinerstraße exit, go left down Kapuzinerstraße to Kapuzinplatz and you’ll see it across the road. 300 metres in all. Returning to Goetheplatz at 2100 the (very young) winos had taken up residence in the ‘booking hall’ and classical music was being played on the platforms. Coincidence? The enquiring spirit still prevailed and having made my way back to Theresienwiese I stepped round the corner to Bavaria Bräu, the Hacker-Pschorr equivalent of the other two. I was glad I had – despite being a huge modern barn next to the ring road, I found it the most congenial of the three. It had the best service, might be the answer! The weissbier was possibly the cloudiest I’ve ever seen but perfectly palatable. With judgment suitably impaired, I tried the helles as well – it got full marks for arriving in a straight glass, if a little narrow! You couldn’t see through this one either, but it too was perfectly acceptable. However, I remain sceptical of these efforts by big brewers to make sure they corner every bit of the market. Still, there was no lederhosen this time, thank goodness. 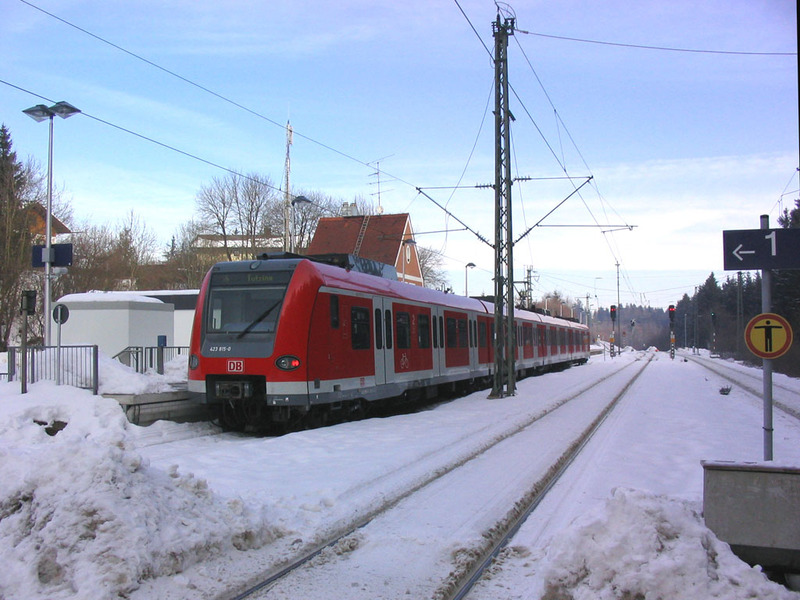 423 815 at the dedicated S-Bahn platform at Kreuzstrasse - the rightmost two platforms are used by Rosenheim-Holzkirchen RBs. 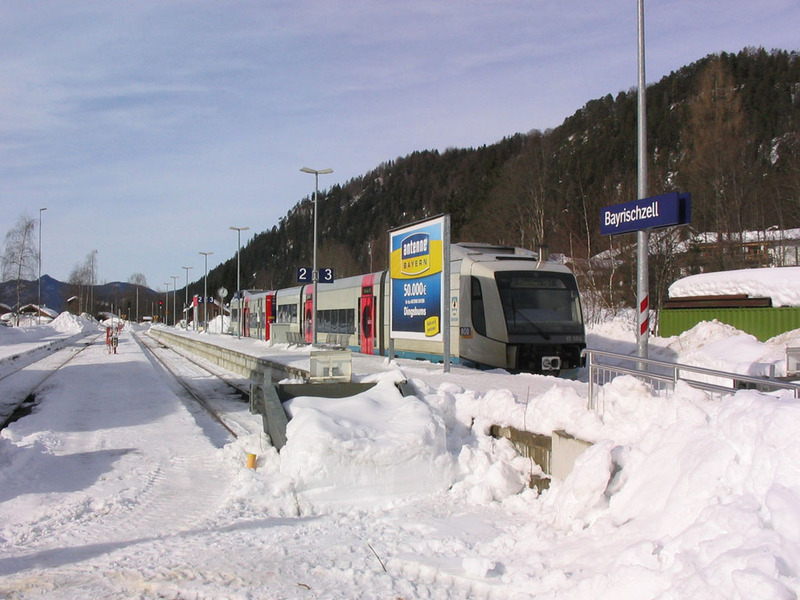 Lenggries, where BOB has a depot just south of the station. 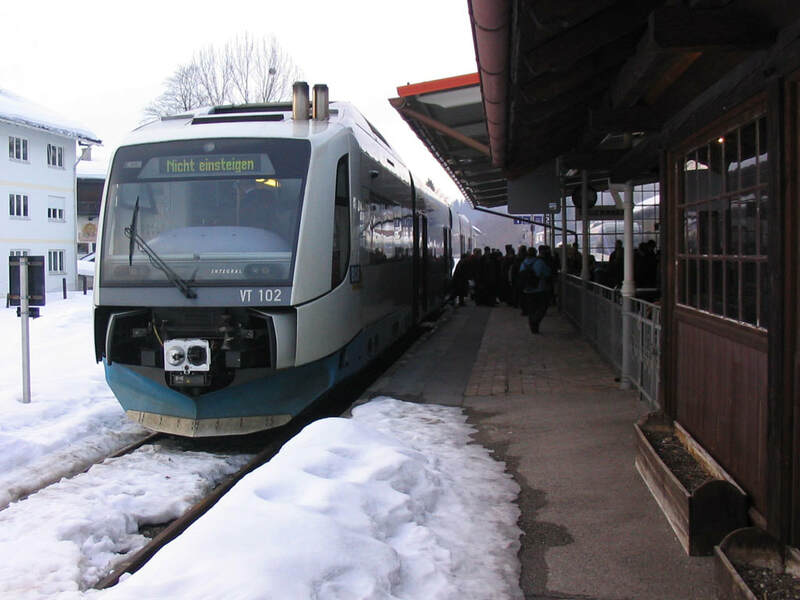 VT104 stands amid piles of snow at Bayerischzell. Tegernsee was the last of the three branches, with the light visibly fading around VT102. Through the glass at the end of the waiting area you can see the 642-lookalike which worked my return journey to München Hbf. Another cloudless if very cold day. Fidelio came up with the best breakfast of the trip, including ruhrei if you so wished. With mission accomplished yesterday there was nothing near enough to do this morning [with the end near for German trackbashing I wanted to make sure that my trips did what they set out to do wherever possible so I’d left half a day spare to mop up if anything had gone wrong along the way] so I wound up making my way to the airport by the 19 tram to Pasing, S4 back to M-Hbf, RB to M-Ost then S7 and S1 via M-Hbf and Laim to the airport! 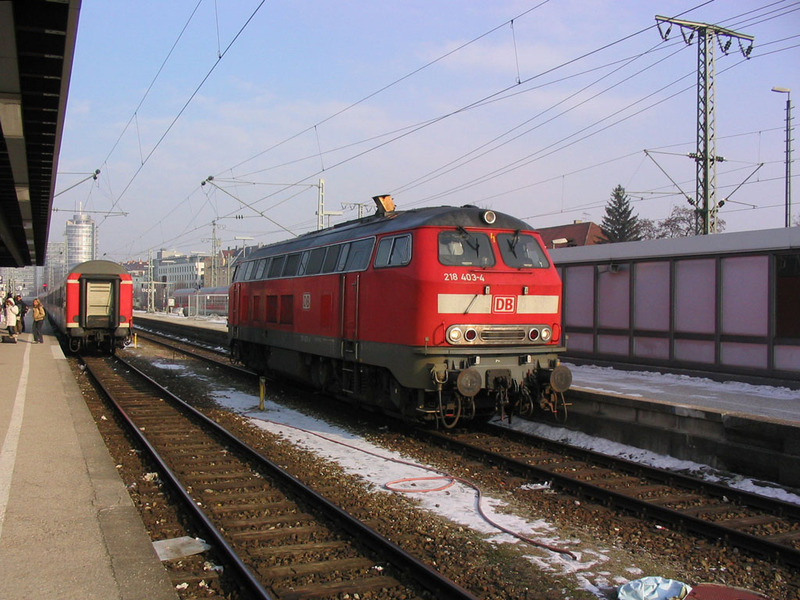 Three 605s (tilting diesel ICEs) were in or around M-Hbf – are these still runners? [Certainly they were used later in 2006 for ferrying World Cup participants around, and other uses are now being rumoured] Also 103 235 was noted at Laim (?) depot. At M-Ost I caught the S7 to Hbf on the basis that it was slightly warmer than M-Ost (Irkutsk probably is, too). Planned 1045 S1 was taken to the airport – I cottoned on just in time that it would split at Neufahrn and was able to do the whole journey in the right (rear) portion. Just a minor wobble at Neufahrn when there seemed to be a signal problem and the driver couldn’t get anyone on the phone. Just 3 late at the airport, so no problem there as I’d left myself time to visit Airbräu which was easily located as I’d passed it on the way in! BA’s wonderful electronic checkin seemed unfazed by my inability to remember which credit card I’d booked with, and yielded window seat 10F after a bit of negotiation! I could do with aisle for speed, really, but it’s such a nice day. Airbräu was the next port of call – unfiltered pils (which I had, malty and really very pleasant) and weizenbier, both at reasonable prices. Well done indeed, München. Others, please copy. It ain’t broke, so don’t fix it. Seasonal beers are also done but there wasn’t one today. Sunday buffet was €18 – well, they have to make a living I guess. BA did reasonably well, with a potentially early arrival at LHR spoilt only by being stacked somewhere just north of Tilbury! I think we were still a few minutes early as I was out of Customs by 1416, 6 minutes after scheduled arrival. Then it was ‘Welcome to Briatin’ with the Piccadilly Line SEVd between Heathrow and Acton Town. This didn’t cause a major problem though, and I made it to Marylebone by 1520 for the 1533 to Snow Hill, one of Chiltern’s harder seated, no coathook, no trolley units. Forgot to note earlier the absolutely derisory BA ‘lunch’ - a small bag of Burt’s lightly sea salted crisps! Chiltern’s timekeeping to Banbury was faultless, waiting for time at most stops. They seem to have learned the lesson which eludes most other TOCs – slightly slower and punctual is better than quick and late. Chapel End Coaches SEVd us from Banbury to Leamington, again on time. Leamington was advising P4 for the 1801 to Snow Hill but as P4 was full of stabled CT 150s this seemed unlikely. P2 turned out to be the platform of the moment, with a more comfortable and coathooked Chiltern unit doing the honours. On time (1841) at Moor Street so no bother to nip across to New Street for the 1857 Chester, a pair of 158s of which the front one was an Arriva set and consequently in fairly reasonable shape. I just beat H to it at Shifnal – ‘we apologise for the delay. This was due to insubordinate cats’. 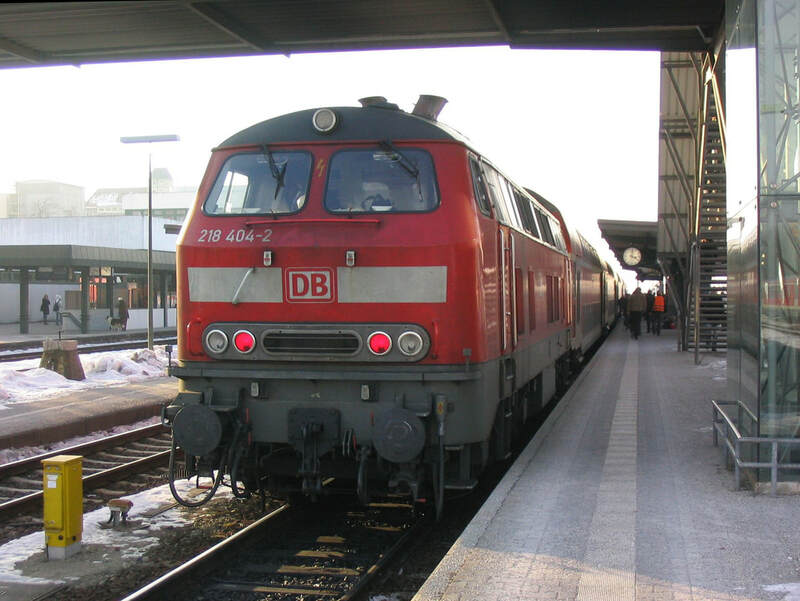 One of the then infamous diesel ICEs, 605 518, standing in the Holzkirchner Bahnhof (the lowest numbered platforms of München Hbf). Major changes were now in prospect in and around Berlin, resulting in some interesting diversions while the final stages of the project were completed. Well, what was I to do? Out came the passport again, and away to Germany.